Journalism Online And In Print Published in the UK and Australia - The Online Home of Michelle Thomas. Blogger. Author. Person With Manners. Seriously, hire me. Look at all the great stuff I've done. ​'Chydig flynyddoedd yn ôl doedd neb yn yn ei wneud o, neu'n gallu ei wneud o. Ond yn yr oes dechnolegol sydd ohoni mae mwy a mwy o bobl yn troi at y we i ddod o hyd i gymar.Er ei bod, i nifer, yn ffordd gyfleus o gyfarfod pobl newydd mae 'na beryglon ynghlwm a'r broses. Ymhlith y rhai sydd wedi cael profiad annymunol o ddêtio ar y we ydy'r flogwraig Michelle Thomas. 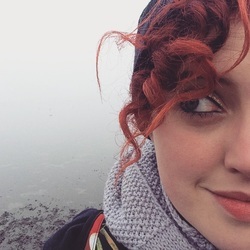 Ers i un dyn wnaeth hi ei gyfarfod ar-lein ei chyhuddo o fod yn 'rhy dew' mae Michelle wedi troi ei golygon at gynghori menywod eraill sy'n awyddus i fentro. From the period when you’re about 15 or 16, it’s hard to figure out what exactly it is you want to do next with your life. I wanted to go to drama school, I auditioned for 3 years and I didn’t get in. In university during the summer holidays I ended up working at the Edinburgh Fringe Festival, and got jobs in comedy thanks to that. Now I’m 31 I’m just starting to feel like I know what I’m doing, which took a lot time, but you shouldn’t worry about that. If you describe yourself as sapiosexual, remember that Jimmy Saville was a member of Mensa. If you value intelligence over empathy, compassion, or humour, you might be better off with a prison pen-pal than a real-life human companion. 2. Just another “____” in London! Just another profile too dull to read beyond the headline! 3. Been hurt too many times / Are there any nice girls out there? I recently saw a profile with the headline “lonely, pessimistic and desperate for love”. Don't. Just don't. Bitterness doesn't make you look sensitive. Self-pity doesn't make us want to be the one to “fix” you. It just highlights the one common denominator in all your failed relationships – you. 4. I never know what to write / Just ask! Sure, out of the 30,000 people on this app, YOU'RE the one special enough for me to care! 5. If you don't look like your profile pics, you're buying the drinks until you do! Usually from guys who've uploaded seven group shots and one close up so grainy it could be Eddie Redmayne, or Dean Gaffney. I’ve finally finished the NHS running podcast. It’s meant to take nine weeks to get you running 5k in 30 minutes. Last week, after six months of regular running, I ran my first 5k. It took 40 minutes. And I couldn’t be more chuffed.Back in 1993, my school report said, “Michelle is eight years old going on 40.” I’m a ponderous, cautious, old-headed kid who doesn’t mix well with others my age. I live entirely in my own brain, in books, in stories. It’s so unfair. I don’t like having a body. Other people don’t like my having a body. So I begin to pretend I simply don’t have one. I ignore it, try to disappear into the background as best I can, and keep my head down and buried in a book. In my teens, I grow to fear and abhor physical exercise. I feel like a different species from every other girl in my year. The most popular girls are the sprightly, sporty ones (one of whom has such body confidence that she wears a blue and yellow Adidas three-stripe two-piece to our swimming lessons, like Sporty Spice). Being that we’re in rural Wales, there are many, many girls who live on farms. Girls who can carry hay bales and fence posts. Girls who spend their weekends traversing acres of land to mend fences and tend to the livestock. Girls who complete the equivalent of one of those trendy Tough Mudder endurance challenges every weekend, summer and winter; staunch, stoic, strong, seemingly unselfconscious girls, who seem to understand that their bodies are tools. Machines. Equipment. I dodge school every Monday and Thursday for about two months. It doesn’t feel like a lie when I tell my parents I have unbearable recurring stomach cramps – the anxiety is genuinely nauseating. The fear is carnal. The tears are real. I'M NUMBER ONE! Thanks guys! And I'm in excellent company, check it out! See that? That's my pot belly. That's where I store most of my extra weight, but I also like to think that's where I store all the f***s I don't give about strangers' opinions about my body. I can play with my nieces all day. I can carry heavy equipment. I can dance at a ceilidh. I can think. I can write. I can laugh. I can love and be loved. And if I do feel hurt, angry, sad, or hard-done-by, I can express myself without directing my negativity at a particular group of people. Without deliberately undermining someone else's confidence to boost my own, say, by wordlessly handing them a card on the Tube that reads "YOU'RE FAT AND UGLY". Frankly, without being a d**k.
That's where health and happiness comes from: self-respect and self-love. And that's where lasting, positive, healthy change comes from, not hatred and humiliation. If you've been body-shamed, please remember it says so much more about the perp than it does about you. I suspect these cards are being handed out as some kind of a publicity stunt – a social experiment or some kind of immersive Hatey Kopkins experience, perhaps to promote some weight-loss product. But the British Transport Police have said they are aware of and are looking into the issue. In the time old tradition of the supermarket Christmas advert, Tesco has stuck to a familiar formula: a stellar cast plays one funny family. In previous years, it was Prunella Scales and Jane Horrocks; this year, it's Ruth Jones, Ben Miller and Will Close. One of this year's adverts, entitled Flirt, features the son, a man in his mid-twenties, following a woman around Tesco as she shops. Every time he attempts to engage her in conversation, she moves away. He follows her. She moves away. He follows her. Compare this behaviour to that in the video for Transport for London's fantastic Report It campaign, encouraging women to report as a crime, ANY behaviour that makes them feel unsafe and uncomfortable, including the kind of behaviour in the ad. I worked in my university library. There was a man who followed me as I stacked the shelves with books. He never spoke to or touched me. He just trailed behind me as I moved between aisles of books, staring at me while I worked. When I confronted him, he laughed. I reported him to security and he never came near me again. 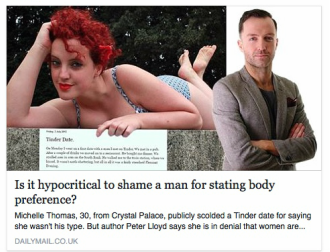 "Is it hypocritical to shame a man for stating body preference?" I hope you're well. I'm fine. Thank you. 1) Michelle Thomas was hailed a feminist hero for criticising a Tinder date who rejected her because of her size ...her response reinforced the odd, unwritten rule that women can say whatever they want about sexual desire and attraction, but men can't.? Pretty sure that men have had quite a large say in shaping the rules of sexual desire and attraction over the last 1000 years or so, Pete mate. You know? Artists. Filmmakers. CEOs for multi-national companies that profit from constantly, covertly and overtly telling women that they are physically inadequate. I don't want to patronise you, but you might want to Google that one. A letter to the young girls who wrote me after my Tinder date said I wasn’t slim enough. Dear Maria, Dear Hayley, Dear Fatima, Asli, Beatriz, Cassandra, Meagan, and Katelyn.Dear Macie. Dear Phoebe. Dear Ava. First of all, thank you so much for emailing me. It’s a brave thing, to confide to a stranger that you’re confused, or lonely, or unhappy. You’re writing to me (I think) because when a man tried to make me feel bad about my body, I responded with what you refer to as a “mic-drop” moment.I told him off for imposing his views about my body upon me uninvited. I told him what it means when a man criticizes a woman’s weight—it substantiates the fear that every girl has (something that, sadly, your letters have confirmed): that it doesn’t matter how funny you are, how clever, how kind, how loyal, how determined or adventurous or vibrant—if you’re overweight, no one will ever be attracted to you. You personify the worst of the internet. As I watched, I expected you to rip off a mask, Scooby-Doo style, to reveal an unmoderated Reddit page populated by trolls. Hi Nicole. I recently went viral because of a blog I wrote about being rejected by a Tinder date for being too fat. I want to address couple of points you made in your video, “Dear Fat People”, since I was so publicly identified as being one myself. If you don’t mind, I’ll come to them one by one. It definitely is. I know, I know you don’t want to believe it, but let me give you a little definition: fat-shaming is when people bully and undermine others for being overweight. Like, for example, making a video expressing your disgust at an overweight young man who does nothing more than sit next to you on the plane - “His FAT was in my LAAAAAP!!!! !” Yep. That’s fat-shaming, Nicole. Iggy Azalea has 'finally admitted' to having surgery. Being a good role model is exhausting, which shows in the face. No wonder so many celebs reach for the knife. According to numerous sources this week, Iggy Azalea has “finally admitted” to having plastic surgery. Others say she's “owned up”. A couple have even said she's “confessed”, the way one would to something terribly shameful, weighing down your conscience, necessary for somebody else to know. And in a way, of course, she has confessed. First she failed to conform to the accepted standards of beauty and was being openly mocked for it (notably by Snoop Dogg). Now she is conforming by surgically altering her looks. In the world of celebrity, this certainly warrants a confession. A week after a blog she wrote on bodyshaming drew interest from the media all over the world, Michelle Thomas tells us why she hopes it might help to start a new conversation. Blimey. It’s all kicked off a bit, hasn’t it? I’m a café manager (I love my job). Earlier this week I took a couple of days off to attend to the press requests. I spoke to the Indie, The Mail, The Evening Standard, The Mirror. I did three radio interviews. Dozens of news companies and publishers picked up the story and re-ran it. I got excited when I heard it had reached Ireland. I was delighted when I saw an Italian version of the story. Fancy job titles and big name bosses inflate the ego but don't always pay the bills - and they come with a heavy amount of stress. A friend of mine works in the costume department for a movie with a budget of over £100m. She's earning around £100 per 14-hour day before tax. The last movie she worked on had a budget of £60m. She worked in a café to get by in the six weeks between the two. “You're just treated like crap, for crap pay because they've blown all the budget on the cast” she says. “There are hundreds of people in the crew, and hundreds more who'd kill for the job. 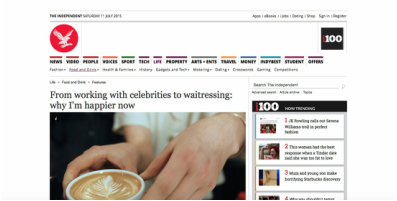 There's no incentive for your employers to treat you well – we're utterly dispensable”. My Nightmare Tinder Date Exposed An Underlying Culture Of Body Shaming. I met Simon on Tinder, and on our date last week, he’d been flirty, affectionate and charming. He walked me to the station, we kissed, and I went home. Lovely, but standard – just the right side of dull. The next day, he sent me a 400-word message. The tone he used was kind and condescending - almost tender - but his sentiment was brutal. He outlined, in forensic detail, how he couldn't possibly perform sexually as he found my body so unattractive. I'm not slim enough for him to be turned on. It was a shocking response but when I wrote a blog about it, I was overwhelmed with messages from hundreds of women saying ‘me too’. In early 2015, Michelle was commissioned to fly to Melbourne, Australia to report on the launch of a album made by ex-TISM frontman and modern day producer / performer extraordinaire Damian Cowell who brought together the country's finest singers (Tim Rogers, Kate Miller Heidke, Liz Stringer), comedians (Shaun Micallef, Tony Martin), commentators (Sam Pang, Julia Zemiro, Justin Heazlewood, John Safran, Lee Lin Chin) and authors, including her fellow ex-pat Kathy Lette (Puberty Blues) to make an historic musical collaboration. S E E N S O M E T H I N G ? D O H O L L E R ! True thanks to all, worldwide, for keeping this important conversation going.